If you are interested in a bulk purchase(12 copies or more) you can email us at girlchildpress@aol.com for a special rate. Please place "Special Bulk Rate" in the subject header. I make it habit to say my "thank yous" throughout the year, but I am totally aware that this year has been full of an extraordinary amount of abundance. There is so much to be grateful for. So many wonderful people who have supported the press, the writers, and me. I can absolutely confirm that that unfailing supportive energy is all you really need to take most of the big steps in your life. I am lucky to constantly have that energy around me and pushing me forward. I hope you all have the same. And no I didn't catch a glimpse of our new president or Oprah. 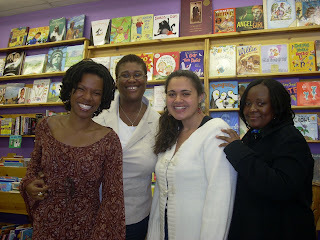 I did get a chance to meet contributors Kimberly Dixon, Sage Morgan-Hubbard and Latiffany Wright at Women and Children First Books. Meeting the contributors and hearing them read their work NEVER gets old. You have not heard a persona poem until Sage lets loose on "If I were a Male" or Big Balls as I like to call it. Latiffany broke our hearts with "Still Breathing". And I personally have a thing for writers that can construct and pull off a convincing kid voice, and Kimberly did just that with "Narcissus" - the best little, self-centered 7 year-old I've heard in a longtime. As I was getting on the plane this morning, I realized we only have two more readings for 2008. Our next stop is A Room of One's Own in Madison, Wisconsin on December 5th and then we wrap it up in Atlanta on December 12th at Charis Books. If we are heading to your neck of the woods, don't miss the chance to come out and hear some wonderful writers! No matter how long the lines are, stay until you cast your ballot. No matter how imperfect you might think our country or political process is, cast that ballot! We are all due for a change:) And I know we have all been caught up in the presidential race but there are plenty of important local and state initiatives that also need your thoughtful attention. I'm curious if we are going to get the mega lines I've seen on the news. I plan to be at my polling place when it opens, but just in case all my neighbors have the same idea, I'm going to take my journal with me (I'm sure there's going to be some great people watching opportunities) and my camera to document this historic election. Please let me know if anything interesting, crazy, or voter suppressiony (I know that is not a word) happens in your neck of the woods. HAPPY VOTING! It has been a full weekend! Friday night started with contributor Lynnette Mawhinney and I hosting a reading at Wooden Shoe Books. This Philly reading was better attended than the previous weekend, but I couldn't help teasing Lynnette with "Philly don't read!" To be fair, we were competing with Halloween and the fact that the Phillies were being feted with a parade at the stadium. In case you didn't read your memo - they won the world series. So the fact that anyone showed up is actually impressive. Saturday afternoon I was joined by contributors Charneice Fox, Lisa Joyner, Tanisha Christie, Deesha Philyaw, Natalie Illum, JScales, Turquoise, and Lynnette (she made her way from Philly) on my home turf of Washington, DC. The cover girl for Just Like A Girl Katie Seitz and GirlChild's graphic designer Kendra Kuliga was also in the house. 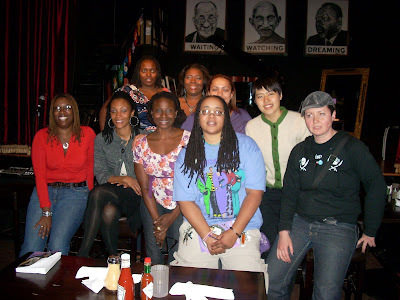 We took over the Langston Room of Busboys and Poets and had a fabulous reading. A very nice blend of poetry and storytelling. 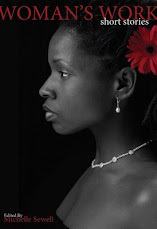 I am touched by all the support and the wonderful things that were said about GirlChild Press. 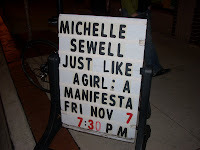 Faye Williams (Sisterspace and Books) was especially eloquent and generous. She has always been one of my number one cheerleaders, encouraging me to push harder and go farther than I think I can. Her encouragement didn't stop with me, she demanded that folks in attendance continue to support independent presses and artists. Folks, that's the only way that we will flourish. Today, I am preparing for my trip to Chicago, where we will read at Women and Children First Books on November 7th at 7:30. 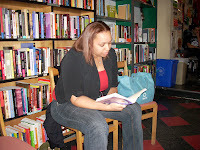 I am also spending time finishing up the call for submissions for the 2009 anthology Woman's Work: The Short Stories. I'll post it tomorrow. Toss in the time change (an extra hour to sleep!) and it has been a wonderful weekend.